UPDATED on 8/20 to include tweet from Loot Crate on their new Shipping Status page. Subscription boxes have become popular with different fandoms over the last few years led by Loot Crate and others like Funko. These subscription boxes usually come every 1 to 2 months with a bunch of nerdy exclusives and other goodies based on a theme. I had been a subscriber for Loot Crate’s main subscription boxes – or “crates” – but canceled my subscription because I was finding the contents and themes for the crates hit or miss. Then late last year, Loot Crate announced they would be doing Star Trek subscription boxes. As you can imagine, I jumped on board immediately and bought a subscription for their Star Trek Mission Crates. How could I turn down getting a subscription box filled with Star Trek exclusives in partnership with Quantum Mechanix every 2 months? 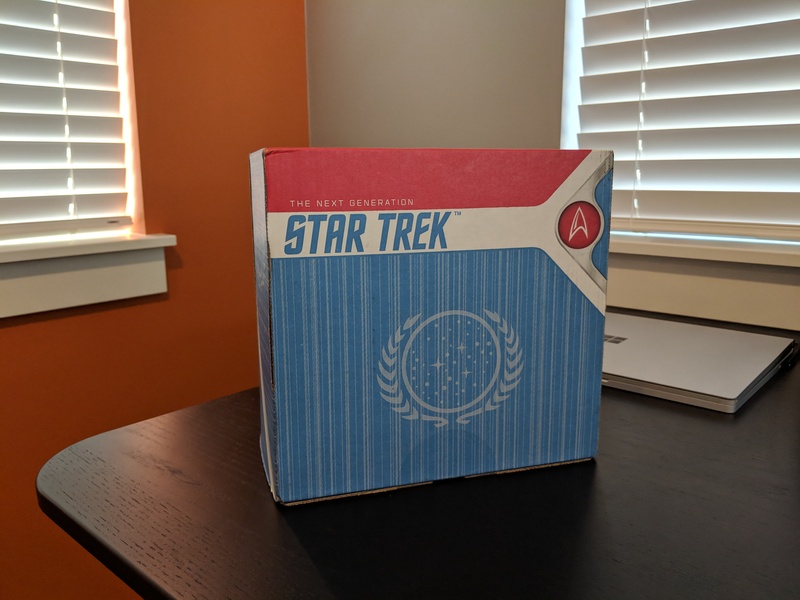 Their first Star Trek Mission Crate subscription box was “Wolf 359” themed. It shipped in January in a box that looked like a shuttlecraft from the Original Series. Inside, it came with an exclusive “Locutus” limited edition statue from QMx and some other goodies. I didn’t blog about it here but this post here does a really good review of the box. Opening the box revealed all the goodies! 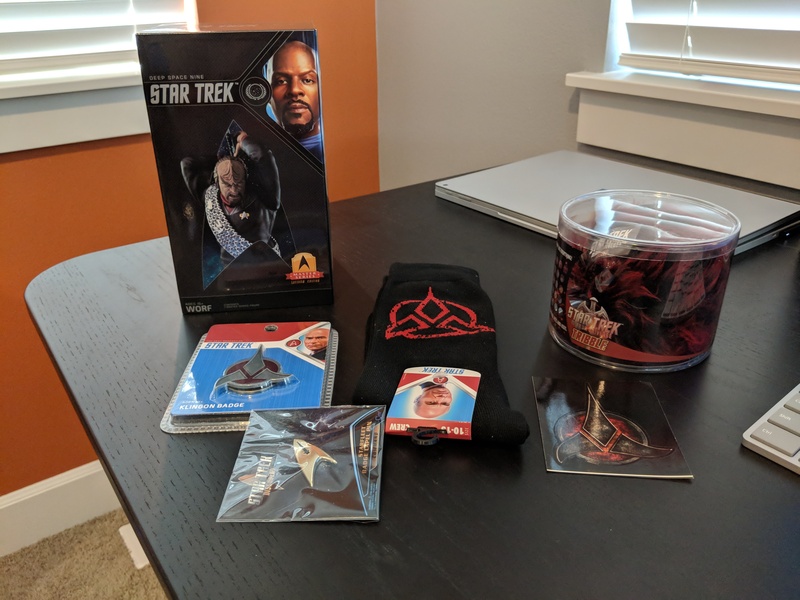 Klingon socks, badge, and sticker with Mirror Universe tribble and Worf! 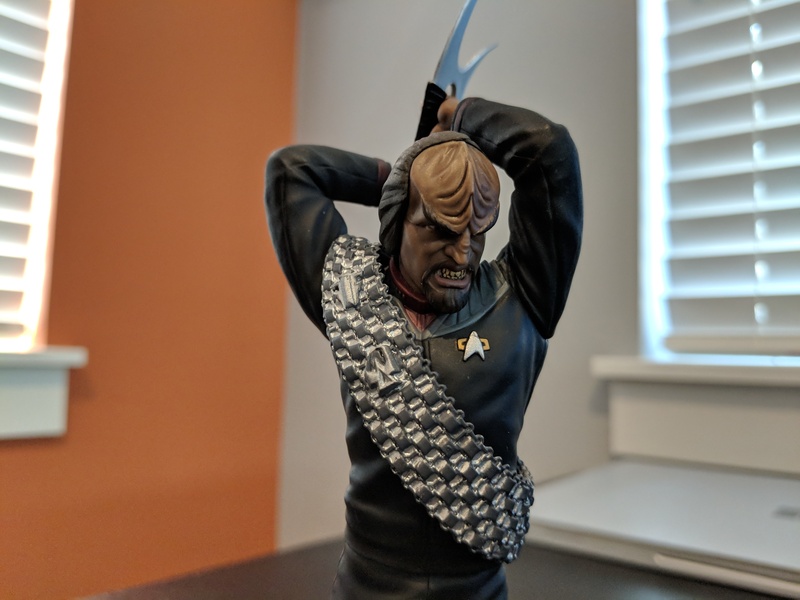 A Worf “Master Series” Limited Edition Statue from QMx. A Mirror Universe Tribble from QMx. A pair of Klingon socks. A Klingon emblem badge from QMx. A Star Trek: Discovery Lapel Pin. Everything is this subscription box was awesome. I believe the Discovery lapel pin was handed out at the 2018 Office Star Trek Convention in Las Vegas earlier this month and since I couldn’t attend – I was glad to score one through this way! I have no complaints about the box. This Star Trek fan is impressed. However, I do have a general complaint about my overall experience with the Star Trek Mission Crate subscription. I feel like Loot Crate is struggling a bit to fulfill the promise of shipping these boxes every 2-months. 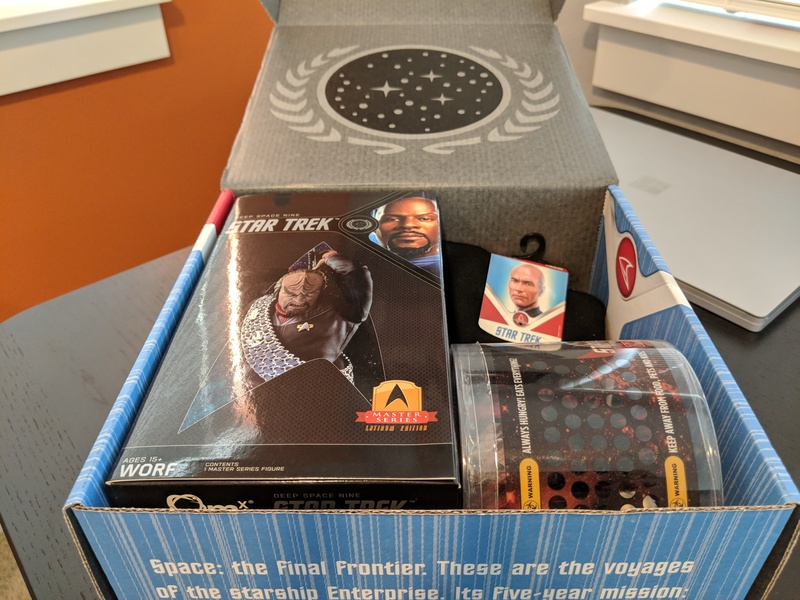 The second Star Trek Mission Crate subscription box was supposed to arrive in March. And it was supposed to be “Dark Frontier” themed after the 2-part Star Trek: Voyager episode “Dark Frontier” and feature Seven of Nine in some fashion. In May, I received an email saying this box was delayed and was expected to ship mid-July. That’s the last thing I heard about that box. Then in early July, I received an email saying that the “Way of the Warrior” box was delayed until late July. No word on what happened with the “Dark Frontier” box. Then on July 31st, I got another email saying the “War of the Warrior” box was delayed again to mid-August. The box finally arrived but still no word on the “Dark Frontier” box. It has been almost 7 months between boxes. I really want to see Loot Crate be more transparent about what’s going on with these boxes, which boxes are supposed to ship when etc. Overall though, I’ve been very impressed with the 2 Star Trek Mission Crates I’ve received so far and really excited for more! UPDATED: Loot Crate responded to my tweet about this blog post alerting me to their new Shipping Status page. It just launched.